Be raring to upgrade to iOS 12? But have you decided how to restore data from iOS 12 of iPhone iPad iPod? Top 3 iOS 12 data recovery tools will be introduced here to help you recover lost data (photos, music, videos etc.) on iPhone iPad or iPod after updating to iOS 12. The brand-new iOS 12 features to express yourself in bold new ways in Messages; clever Siri suggestion, Siri shortcuts, new Measure App, group FaceTime, more advanced Photos and Camera App, screen time, Do Not Disturb and 70% faster performance on swipe camera, 50% faster for keyboard display and twice faster to launch app in heavy workload. Are you unable to hold back your excitement of iOS 12 update? But before the upgrade, another thing - iOS 12 data recovery needs to be taken into consideration, which is most urged to get lost data, one of the major iOS 12 update problems so far. You may accidentally loss your memorable photos, favorite music or treasured videos as you upgrade to iOS 12. How to recover lost data on iOS 12? Here I list top 3 data recovery software for iOS 12 to retrieve data from iPhone iPad iPod on iOS 12. If you backup iPhone iPad data to computer before iOS 12 updates, you can calm down when you loss data on iOS 12 update process. 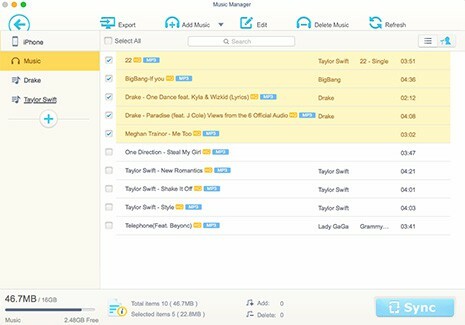 Resort to MacX MediaTrans to transfer music, photos, video, ringtones, iBooks and more from computer to iPhone iPad to get iOS 12 data recovered within seconds only! No iTunes/iCloud! Actually, the best solution for iOS 12 data recovery is to backup iOS 12 content beforehand other than recovering lost data on iOS 12 thereafter. You can absolutely import your backed-up data to iOS devices after upgrading to iOS 12. 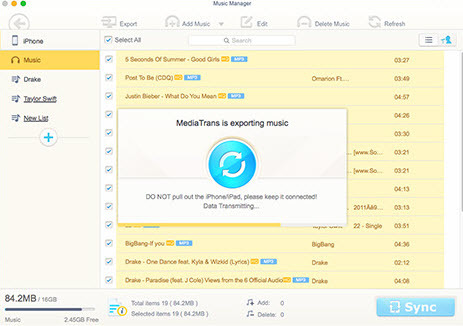 MacX MediaTrans is the ideal iOS transfer, both applying to backup iPhone iPad iPod photos, music and videos to Mac selectively and import them back to finally recover data from iOS 12 iPhone 7/8/X/XS/XR iPad iPod. 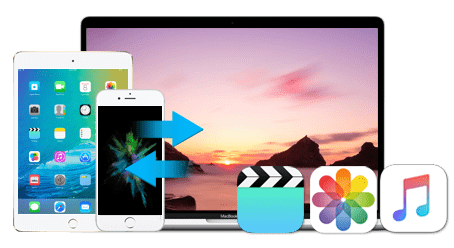 It works as an expert in transferring videos photos and music from iPad iPod to Mac so that you can backup iPhone iPad iPod to computer to avoid data loss. Still, thanks to the Intel QSV Hardware Acceleration tech, the iOS backup software delivers a super fast solution to backup iPhone 6 on iOS 12 to Mac. Prior to recovering lost data on iOS 12, you need backup your data first. To do this, free download iOS backup software is essential for you to carry on. By the way, it is available on Mac OS X 10.7 or above, iOS 7 or above. Since you can get iOS 12 data recovered without iTunes, turn off the iTunes auto sync in case of any data loss. 1. Launch MacX MediaTrans on your Mac and connect your Mac to iOS device with a USB cable. 2. Click the icons (Photos Transfer, Music Manager, Video) on the main interface respectively to enter the correspondent data backup windows. And check the box of "Select All" to choose all your photos, music and videos as you like. 3. Click "Export" button to backup your iOS data to Mac. After you upgrade to iOS 12, you are suggested to retrieve data from iPhone iPad iPod on iOS 12. Just go to the music or video window within the steps above and click "Add Music" or "Add Video" button to restore iPhone data from iOS 12. Note: Apart from the originally iOS data recovery, you can also import music or videos from Mac to iOS devices for offline watching. It's remarkable that this iOS transfer enables you to move videos of any formats, no matter the MP4, M4V, or MKV, AVI, FLV, 3GP etc. It will auto convert unsupported video formats to iPhone iPad iPod during the transferring process. 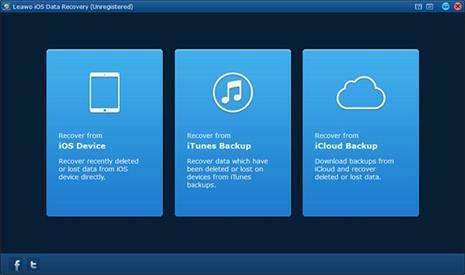 iCloud is the most common way for Apple users for iOS data recovery and backup even if it's complicated for beginners. iCloud requires you to use the Set Up Assistance, as well as a stable Wi-Fi connection otherwise the entire transfer fails or takes up a whole lot of time. Still, there is a limitation for free iCloud storage, 5GB only. If your iOS data that you're going to backup is exceeded, you need to pay for it. Anyway, iCloud can solve iOS 12 problems about backup and recovery indeed. 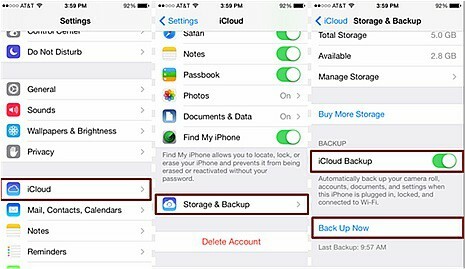 Let's check the tutorial of iOS 12 data backup and recovery via iCloud. 1. Connect your device to a Wi-Fi network. Tap Settings, then scroll down and tap iCloud. And scroll down, tap Backup, and make sure that iCloud Backup is turned on. 2. Make sure that the backup finished: Tap Settings > iCloud > Storage > Manage Storage, then select your device. The backup should appear in the details with the time and backup size. 1. Go to Settings and click on General. Then go to the Setup Assistance mode. 2. Swipe on the screen to begin the setup process on the device. Restore from iCloud Backup > Sign in iCloud using Apple ID. Stay connected to a stable Wi-Fi network. 3. 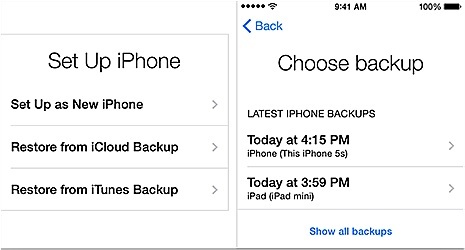 Select the iCloud backup you want to restore and wait for the contents to back up. Depending on the speed of the network and the sizes of the files, this may take some time. Specialized iOS data recovery software is also hot favorite to recover data from iOS 12 iPhone iPad iPod. Leawo iOS Data Recovery is precisely the outstanding advocate. It is a program ( available for both Windows and Mac) that allows you recover 12 different types of lost files: photos, videos, contacts, messages, voice memos, call history, notes etc. All in all, Leawo iOS Data Recovery behaves as an expert to retrieve data from iPhone iPad iPod on iOS 12 with these salient features below. 6. User-friendly interface, simple operations & fast data recovery. Top rated software to backup and restore iOS 12 data, which delivers the world's fastest solution to backup old iPhones quickly and retrieve data (music, photos, videos) from iPhone on iOS 12.